The Senate appears headed for a showdown, with Sen. Charles Schumer, minority leader and perennial anti-gunner, blustering a challenge to Republicans to go ahead and try. Sixty votes are needed to avoid a Democrat filibuster. 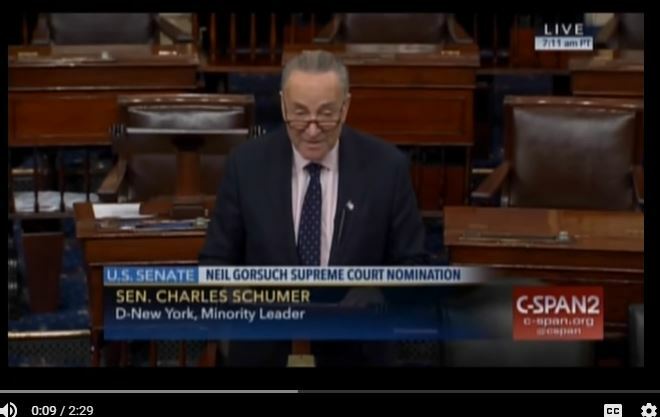 “It’s going to be a real uphill climb…to get those 60 votes,” Schumer said. Democrats have become known as the “party of gun control,” and liberals would like to see reversals of the 2008 Heller and 2010 McDonald rulings. With Gorsuch on the high court, there would be a return to balance. Gorsuch is described as an “originalist” who relies on the original intent of the Constitution and its authors. Senate Democrats following Schumer’s lead, however, seem determined to reinvent the Supreme Court.